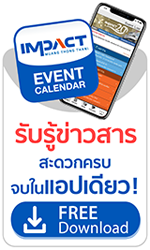 Held consecutively since it first staged in 1984, Thailand International Motor Expo always brings its A game to the Thai automobile industry. With this year’s theme “Enjoy Driving! Before Driverless Era” to display the hottest designs, the most innovative technologies, and a complete range of domestic and imported cars, trucks, SUVs, concept cars, as well as motorcycles, the 35th Thailand International Motor Expo 2018 welcomes more than 36 automakers from 9 countries, 23 motorcycle makers from 7 countries, and upwards of 300 vendors of auto accessories, accompanied by local distributors and guests of honor to the stage during the opening ceremony at the Royal Jubilee ballroom where the organizing chairman, Kwanchai Paphatphong, gives a speech followed by the official launch of the 35th Thailand International Motor Expo 2018, from November 29 – December 10, 2018, at the Challenger 1-3.